Amazon Sumerian announced: A new service to build Virtual Reality (VR), Augmented Reality (AR) and 3D applications. At the AWS re:Invent Midnight Madness kick-off event, Amazon Web Service (AWS), an Amazon.com company, announced Amazon Sumerian, a new service that makes it easy for any developer to build Virtual Reality (VR), Augmented Reality (AR), and 3D applications, and run them on mobile devices, head-mounted displays, digital signage, or web browsers. 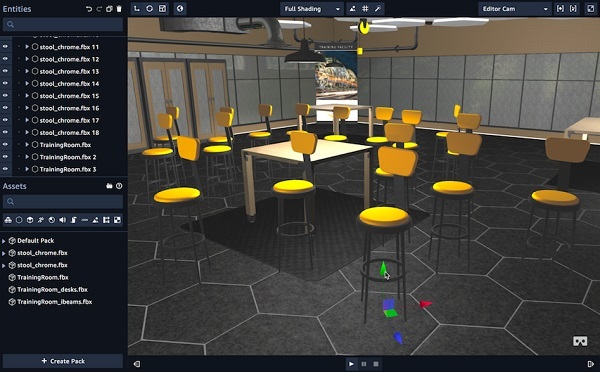 With Amazon Sumerian's editor, developers can build realistic virtual environments, populate them with 3D objects and animated characters, and script how they interact with each other and the application's users. VR and AR apps created in Amazon Sumerian will run in any browser that supports WebGL or WebVR graphics rendering, including Daydream, HTC Vive, Oculus Rift, and iOS mobile devices (support for Android ARCore coming soon). Amazon Sumerian provides a web-based editor that developers can use to easily and quickly create professional-quality scenes, and a visual scripting tool to build the logic that controls how the objects and characters in the scenes behave and respond to actions. Amazon Sumerian also makes it easy to build scenes where rich, natural interactions between objects, characters, and users occur through the use of AWS services such as Amazon Lex, Amazon Polly, AWS Lambda, AWS IoT, and Amazon DynamoDB. Amazon Sumerian's easy to use editor allows developers to drag and drop 3D objects (e.g. furniture, buildings, and natural objects) and characters into "scenes" (e.g. rooms, office environments, and landscapes). Developers can choose from Amazon Sumerian’s library of pre-built objects, download and import objects from third-party asset repositories such as Sketchfab or Turbosquid, or create and import their own objects. Amazon Sumerian also includes templates with pre-populated scenes. Developers can also use Amazon Sumerian to create animated 3D characters that can guide users through a scene by narrating scripts or answering questions. Amazon Sumerian is integrated with Amazon Lex and Amazon Polly, which provide automatic speech recognition (ASR), natural language understanding (NLU), and text-to-speech capabilities, so that Amazon Sumerian characters can understand and respond to users in lifelike conversations. Amazon Sumerian scenes run in any browser that supports WebGL or WebVR graphics rendering. Amazon Sumerian scenes are hosted in the AWS cloud and served from a publicly accessible endpoint, so that users can access them from anywhere. Getting started with Amazon Sumerian is as simple as logging into the AWS Management Console. There is no software to install or upfront costs-customers pay only for the storage used for 3D assets and the volume of traffic generated to access the virtual scenes they create.